I am a PhD student majoring in Biostatistics at DLSPH. I aspire to develop new biostatistics methods that can assist public health evidence-based research. 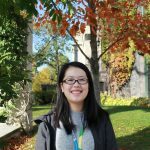 I was first introduced to the world of biostatistics during my 4-month undergraduate internship as a statistical consultant in the pediatric department at University of Alberta. I fell in love with this subject immediately where I could extend my love for math (and numbers) and engage in real-life applications. The school itself is located around several distinguished medical research institutes and major teaching hospitals in Canada. It’s the absolute ideal school to receive not only statistical methodology training, but also for opportunities to participate in ongoing research projects conducted at affiliated institutes, and opportunities to forge collaborations with knowledge users who would benefit from my PhD research. My PhD research will focus on developing new biostatistics methods that permit causal inference from complex longitudinal data. I am currently working with Dr. George Tomlinson at the University Health Network and Dr. Brian Feldman at Sickkids to complete a pilot, comparative effectiveness study on the current consensus treatments for juvenile dermatomyositis, a rare inflammatory disease affecting the skin and muscles. This is a fantastic applied opportunity where I am encouraged to take initiative in selecting and comparing different statistical approaches. After three years working as a research analyst, mainly conducting data cleaning and statistical analysis in SAS, coming back to school to start evaluating integrals wasn’t easy! Thanks to all the help, support and patience from my peers and my supervisor, the transition back to school was challenging, but also exciting and rewarding. The best part about being a DLSPH student in Biostatistics is the people. Here, students, professors and the administration team all come together as a close and caring community. Studying at DLSPH, I have the opportunity to learn and get inspired everyday by many amazing and brilliant colleagues and faculty, who I also became friends with and consider to be my family. Be an advocate for health and health education. As biostatisticians, we should always keep in mind that the most important goal is more than developing and applying the most appropriate statistical methods, it’s the ability to clearly translate and communicate our analytical findings to understandable information for everyone.